Let me start by saying that I am NOT a ClickOnce expert, yet today I encountered a problem and thought of sharing with you guys my experience. So I was deploying a ClickOnce installer on a server and when I clicked “Publish Now”, I got an error saying “….The Web server does not appear to have FrontPage Server Extensions installed……”. The first thing I tried was to change the “Publish Folder Location” to my local IIS (localhost) which worked fine on my machine, yet when I tried the ClickOnce installer on another machine it did not work because setup.exe was trying to connect to my machine to download the *.application file. After some research I found out that you can publish the ClickOnce to a location and instruct it to do download from another location. 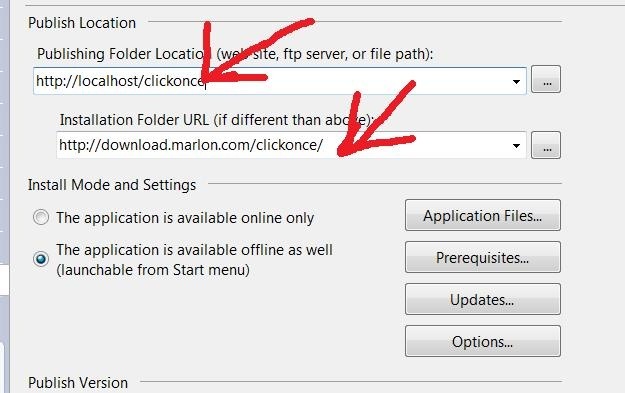 In order to do this you have to put the URL of the live server in the “Installation Folder URL” textbox which is located below the “Publishing Folder Location” textbox (as shown in the image below).